Update: I am reposting this series on Nuclear Power Industry subsidies in proper order. This reposting will serve as an introduction to a new series on subsidies which will look at the justification of subsidies as well as their motives. The primary focus of these new posts will be on the justification, if any, of nuclear power subsidies. Any analysis of nuclear industry subsidies should begin with definitions of the terms "Nuclear Industry" and "subsidy." We need to understand what it is we are talking about before we can talk intelligibly. The broadest meaning of term "nuclear industry" can only be understood nominally. Both the medical uses of radioactive isotopes, and the manufacture of nuclear weapons are understood as activities of the Nuclear Industry, but they are very different sorts of activities, usually carried on by different industrial organizations. For example, some materials used in nuclear weapon are manufactured in specialized reactors, and medical specific radioisotopes are also manufactured in specialized reactors. At one time the same reactors might have been used for both purposes, but current requirements lead to a separation of medical isotope and nuclear weapons manufacture technology, and those two activities may not be carried on by the same organization. Nuclear medicine and nuclear weapons production are regulated by different sets of laws,rules and regulations. Thus, for example, reactors used in the production of medical radioisotopes are required by international regulation to use low enrichment uranium, while military reactors are not required to do so. The handling sale and use of reactor modified actinides used in weapons, is regulated by a different set of rules than those governing the handling, sale and use of fission products. Thus statements true about set of economic activities - for example the production, sale and use of medical radioisotopes - may not be true about a different economic activity - for example the manufacture of reactor modified actinides for nuclear weapons use. The government pays for the research and development of military reactors, but this is not a subsidy, since the government, through its military arm, intends to use the reactors. Many products developed under the auspices of military or other government programs, cannot be spoken of as subsidized. For example, the jet engine originated from civilian developed technology, but the first aircraft uses occurred in a military context. It would not seem however, that government investments in military jet technology was a subsidy for civilian military jet aircraft related industries. Monetary assistance granted by a government to a person or group in support of an enterprise regarded as being in the public interest. assistance given by one person or government to another. Payment or other favorable economic stimulus (such as remission of taxation) given by government to certain individuals or groups of economic entities, usually to encourage their continued existence, growth, development, and profitability. In the United States, subsidies are given to the agricultural industry, the very poor, and many other groups. A transfer of wealth intended to encourage specific behavior considered to be beneficial to the public welfare. The term subsidy has had widely varied usage in the 20th cent. Subsidies may be granted to keep prices low, to maintain incomes, or to preserve employment. They are most important as grants to private corporations for performing some public service, such as to shipping companies and airlines for carrying the mail or to railroads for maintaining passenger service. These are often required where a necessary public service, particularly one that might otherwise not be profitable, is granted funds to remain in operation. . . Other commonly subsidized enterprises include agriculture (see agricultural subsidies), business expansion, and housing and regional development. . . . Medical and educational institutions are among the largest recipients of subsidies. . . Subsidies have also been granted by one country to another country to aid it in pursuing a war effort, to gain its goodwill, or to help stabilize its economy. Thus subsidies are payments in which the payer does not receive goods or services, or payments in kind. Subsidies may be direct, or indirect. For example, government subsidies to farmers, intended to keep them in business even when food sells at a low price, in effect indirectly subsidizes me as a good purchaser. In effect everyone is a recipient of indirect subsidies. It this follows, that short of scrapping the entire system of government subsidies, singling out individuals, businesses or industries to question their subsidies may punish them, and indeed may punish them unfairly. Now if a government gives an individual money or indirect and receives something, arguably of comparable worth in turn, the arrangement may not involve a subsidy. For examples government payments to sailors in the Navy, are salaries, not subsidies. In many instances military financed Research and Development, has contributed to private Industry. Radio is an example of how government sponsored development can set the stage for flourishing new markets. During World War I the United States government came ro regard radio as an important military tool. The Government took over control of all aspects of radio, with notable long term results. During World War One the military took over control of the entire U.S. radio industry, and in conjunction with the major electrical firms made great strides in radio engineering using vacuum-tubes. In addition, wartime work exposed thousands in military service to the changes which were taking place, especially with respect to vacuum-tube equipment. The Vacuum Tubes entry by Major General George O. Squier, in the Signal Corps section of the 1919 edition of War Department Annual Reports, reviewed the advances made in vacuum-tube manufacturing and engineering from 1917 to 1919, with the prediction "That vacuum tubes in various forms and sizes will, within a few years, become widely used in every field of electrical development and application is not to be denied." And shortly after the war ended articles started to appear that showed a comprehensive scientific understanding and explanation of the design and operation of vacuum-tubes, for example L. M. Clement's The Vacuum Tube as a Detector and Amplifier (extract), from the April, 1920 issue of QST. H. Winfield Secor's The Versatile Audion, which appeared in the February, 1920 Electrical Experimenter, reviewed the advances taking place in thirteen areas of vacuum-tube engineering. In April, 1919 American Telephone & Telegraph, employing vacuum-tube versatility from six of Secor's categories, transmitted speeches and entertainment by phone lines and radio to a Victory Liberty Loan drive, as reported by Speeches Through Radiotelephone Inspire New York Crowds, from the May 31, 1919 Electrical Review. By 1922 vacuum-tubes had been firmly established as a major technological advance, and the Vacuum Tubes chapter of William C. Ballard, Jr.'s 1922 Elements of Radio Telephony reviewed the device and its construction. While radio remained off-limits for the general public during the war, there were occasional hints of what lay ahead. Wireless Music for Wounded Soldiers from the April, 1918 The Wireless Agereviewed a short-range electrostatic induction system that could be used to entertain hospitalized soldiers with music and news. And between the cessation of hostilities in November, 1918, and the end of the civilian radio restrictions in 1919, there were scattered reports of military personnel firing up transmitters in order to broadcast entertainment to the troops -- for example a February 2, 1919 "Moonlight Witches Dance" transmitted from off the coast of San Diego, California by the battleship Marblehead, reported inMusic by Wireless, in the March, 1919 issue of Telephone Engineer. In addition, the May 7, 1919 Dallas Morning Newsreported that U.S.S. George Washington, during its transatlantic crossing, had employed its radio transmitter to provide nightly aConcert by Wireless for Vessels at Sea. After the war, government controls of radio were lifted, and commercial broadcasting, boosted by war time government financed Research and development took off with astonishing speed. By some definitions, the government investment in radio R&D could be considered a subsidy to the commercial radio industry. I have already noted the role that government subsidies played in the development of Jet Aircraft. It should be noted the extent to which the military development of jet aircraft lead to the emergence and growth of the modern commercial passenger Jet aircraft industry. Boeing designed the KC-135 aircraft in response to a military need for fast air tankers, to refuel jet bombers in the air. The KC-135 was powered by the J57 turbojet, first designed for use by B-52 bombers. Although designed for military use, Boeing designed the KC-135 to be wide enough for 6 passenger to a row seating, a feature which Boeing engineers included for commercial rather than military purposes. The design Boeing 707, the progenitor of the modern Commercial Passenger Jet Industry was derived from the KC-135. Thus it could be argued that the modern passenger jet industry was based on government subsidized research and development programs. The development of the 707 was not the first time the United States government aided a transportation related industry. The government dredged harbors and navigation channels during the 19th century and continues to do so, thus subsidizing the the shipping industry. During the 19th century the government subsidized railroads by land grants, and though mail shipment contracts. During the early 20th century, airmail shipment contracts were given to early air lines under very generous terms. (3) capital gains treatment of the sale of oil and gas properties. An oilman drills a well that costs $100,000. He finds a reservoir containing $10,000,000 worth of oil. The well produces $1 million worth of oil per year for ten years. In the very first year, thanks to the depletion allowance, the oilman could deduct 27.5 per cent, or $275,000, of that $1 million in income from his taxable income. Thus, in just one year, he's deducted nearly three times his initial investment. But the depletion allowance continues to pay off. For each of the next nine years, he gets to continue taking the $275,000 depletion deduction. By the end of the tenth year, the oilman has deducted $2.75 million from his taxable income, even though his initial investment was only $100,000. President John Kennedy was fighting to repeal the oil depletion allowance at the time of his death, and a Democratic attempt to repeal it was recently killed in the Senate. Amazon, as you may have heard, is sitting on a massive tax-abatement package and other incentives that could ultimately cost Tennessee more than $100 million in revenue over the next decade. In exchange, the company is offering to create about 1,200 full-time jobs at two distribution facilities in or near Chattanooga. Of course Tennesseans who shop from Amazon benefit too, by avoiding taxes on locally bought goods. Tennessee has given generous incentives to manufacturers — the usual free real estate, property tax abatements, infrastructure improvements and training for workers. In addition, the state has included the unusual and highly questionable behind-closed-doors private letter rulings to exempt new industries from collecting Tennessee sales tax or paying other taxes that long-established businesses pay. * The cost of tax breaks and subsidies which, as indicated above, shift tax burden and costs from “wind farm” owners to ordinary taxpayers and electric customers. * The cost of providing backup power to balance the intermittent and volatile output from wind turbines. • The full, true cost of transmitting electricity from “wind farms” to electric customers. “Wind farms” are highly inefficient users of transmission capacity. Capacity must be available to accommodate the total rated output but, because the output is intermittent and volatile, that transmission capacity is used only part time. The wind industry seeks to avoid these costs by shifting them to electric customers. * The extra burden on grid management. Adding Cape Wind would lead to a reduction in the wholesale cost of power averaging $185 million annually over the 2013-2037 time period, resulting in an aggregate savings of $4.6 billion over 25 years. With Cape Wind in service, over the 2013-2037 time period, the price of power in the New England wholesale market would be $1.22/MWh lower on average. The true cost of electricity from wind – particularly offshore wind — is huge. No one who is paying attention expects the price that Cape Wind charges for its electricity to be cheap. In fact, over 25 years, the wholesale cost to New England utilities for electricity from Cape Wind apparently will be well over $5.75 billion and probably much more. Does anyone in New England seriously expect that the WHOLESALE price of non-Cape Wind electricity in New England will average $0.20 or $0.24 per kWh over the next 25 years (up from about $0.08 per kWh in 2008.
a. Production tax credit (PTC). The Cape Wind project owners would be eligible to receive a federal tax credit, currently $0.021 per kWh for electricity produced during the first 10 years of the project life. Using the production apparently expected by Cape Wind (1,150,000,000 per year) a $0.021 per kWh credit (which is adjustable for inflation), would permit the owners to avoid federal corporate income taxes of $24,150,000 per year or $241,500,000 over 10 years. The recent federal “stimulus” legislation– The American Recovery and Reinvestment Act of 2009–gives “wind farm” developers the option of selecting an investment tax credit in lieu of the PTC or electing to receive from the US Treasury a cash grant equal to 30% of eligible capital costs! Again, ordinary taxpayers pick up the tab. b. Accelerated depreciation. “Wind farm” owners are also permitted by the IRS to use the lucrative “5-year double declining balance accelerated depreciation” (5-yr; 200%DB) to recover the capital costs from their otherwise taxable income. Depreciation deductions would permit the owners to avoid $490 million in federal corporate income taxes – in addition to the Production Tax Credit – again shifting the tax burden to ordinary taxpayers. Massachusetts green credits, totaling $1.7 billion over the entire 25-year lifespan [projected Cape Wind generator lifespan], would be worth $487 million. National Grid customers will experience sticker shock after the giant utility negotiates a long-term electric contract with Cape Wind developers, energy experts warn. Business groups worry that a National Grid contract with Cape Wind, which needs a long-term deal to secure funds to build a giant wind farm off Cape Cod, could add tens of millions of dollars per year to electric bills. They point to a recent price agreement between National Grid and a Rhode Island wind-farm developer as cause for alarm. The Rhode Island deal calls for National Grid to pay an eye-popping 24 cents per kilowatt hour for electricity from Deepwater Wind’s proposed wind farm off Block Island for 20 years. That’s three times higher than the current price of natural-gas generated electricty – and the Rhode Island deal includes a 3.5 percent annual price increase over the life of the contract. Rhode Island officials have estimated the small Deepwater contract will add about $1.35 per month in the first year to an average residental customer’s bill – and it will add far more to the bills of big energy-using companies. Analysts say a Cape Wind contract could come in at about 15 cents per kilowatt hour – about twice as high as current prices for natural-gas generated electricity. “It’s still double the price – and the ratepayers will be picking up the tab for it for 20 years,” said Robert Rio, a senior vice president at Associated Industries of Massachusetts. One source, who supports the Cape Wind project, said officials are hoping National Grid can negotiate a price at about 12 to 14 cents per kilowatt hour in the first year – but that’s still far above today’s 6 to 8 cents for natural-gas generated electricity. Dennis Duffy, a vice president at Cape Wind, cautioned that the price of natural gas is volatile and was much higher only a few years ago, before the global recession dramatically reduced energy prices. Cape Wind stands by its assertion that it will eventually save customers an average $25 million a year, when the long-term advantage of free wind starts to exert competitive pressure on other power generators, Duffy said. The $1 billion-plus price of building and installing Cape Wind’s 130 giant turbines on Nantucket Sound will have to be paid for, he said. But the long-term price and environmental benefits of wind farms will a huge plus, he said. Peter Beutel, an analyst with Cameron Hanover, said he agrees wind farms are “worthwhile in the long run” for energy markets. “But can I justify (wind energy) financially today? No I can’t,” he said. This then is a context in which the topic of nuclear subsidies can be properly discussed. In the second part of this discussion I will discuss the Analysis of nuclear subsidies made by Doug Koplow in "Nuclear Power: Still not viable without subsidies." The mining and milling stages have historically been environmentally damaging, and available data (Table 15, p. 61) indicate the taxpayer cost to address these issues has rivaled the market value of the minerals extracted. Fuel costs are one area of steadily increasing efficiency and cost reduction. For instance, in Spain the nuclear electricity cost was reduced by 29% over 1995-2001. This involved boosting enrichment levels and burn-up to achieve 40% fuel cost reduction. Prospectively, a further 8% increase in burn-up will give another 5% reduction in fuel cost. Uranium has the advantage of being a highly concentrated source of energy which is easily and cheaply transportable. The quantities needed are very much less than for coal or oil. One kilogram of natural uranium will yield about 20,000 times as much energy as the same amount of coal. It is therefore intrinsically a very portable and tradeable commodity. 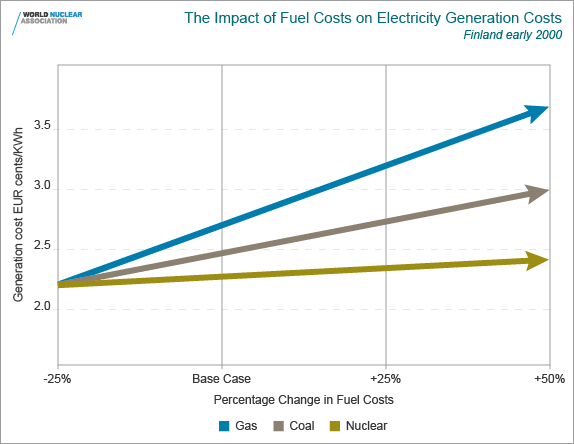 The WNA argues that increases in nuclear guel costs has little effect on the cost of nuclear produced electricity. Doubling the uranium price (say from $25 to $50 per lb U3O8) takes the fuel cost up from 0.50 to 0.62 US cents per kWh, an increase of one quarter, and the expected cost of generation of the best US plants from 1.3 US cents per kWh to 1.42 cents per kWh (an increase of almost 10%). So while there is some impact, it is comparatively minor, especially by comparison with the impact of gas prices on the economics of gas generating plants. In these, 90% of the marginal costs can be fuel. Only if uranium prices rise to above $100 per lb U3O8 ($260 /kgU) and stay there for a prolonged period (which seems very unlikely) will the impact on nuclear generating costs be considerable. Nevertheless, for nuclear power plants operating in competitive power markets where it is impossible to pass on any fuel price increases (ie the utility is a price-taker), higher uranium prices will cut corporate profitability. Yet fuel costs have been relatively stable over time – the rise in the world uranium price between 2003 and 2007 added to generation costs, but conversion, enrichment and fuel fabrication costs did not followed the same trend. For prospective new nuclear plants, the fuel element is even less significant (see below). The typical front end nuclear fuel cost is typically only 15-20% of the total, as opposed to 30-40% for operating nuclear plants. Kaplow claims that the Civilian Nuclear power industry is subsidized by government tax policies that benefit all mines. Subsidies to uranium mining and milling come through three main routes. First, special percentage-depletion allowances for uranium allow highly favorable tax treatment for this mineral. Second,“hardrock” mining on public lands, including uranium mining, is governed by the arcane and archaic Mining Law of 1872. This law, which has withstood numerous attempts at modernization, enables extraction of hardrock minerals with very low payments and no royalties, and it includes patenting provisions that allow public land to be privatized for only a few dollars per acre. Third, there are bonding requirements for post-mining restoration, but they are too modest, resulting in significant residual damage at uranium mines—a public health and safety obligation that falls to the taxpayer. The government has also historically sought to main- tain a strategic stockpile of uranium, though the impacts of this effort on the industry have varied over time—sometimes reducing costs to users, and other times restricting cheaper supply and driving up prices (PNL 1978: 118–126). But note that these government policies are not intended to subsidize the Civilian nuclear power industry directly. Cameco is a major supplier of uranium processing services required to produce fuel for the generation of clean electricity. Cameco's Port Hope conversion facility is one of only four commercial uranium hexafluoride (UF6) production plants in the western world. UF6 is exported to international customers, to be enriched for use in light water nuclear reactors. The Port Hope facility is also the world's only commercial supplier of natural uranium dioxide (UO2) conversion services needed to produce fuel for Candu nuclear reactors. Both processes receive refined uranium (UO3) feed from Cameco's uranium refinery located in Blind River, Ontario. Cameco also has access to additional UF6 capacity through a toll processing agreement with the Springfields Fuels Limited plant located in Lancashire, UK. Cameco operates a fuel manufacturing facility in Port Hope, Ontario and a metal fabrication facility in Cobourg, Ontario. The company manufactures and sells the fuel bundles used in Candu reactors, serving nuclear utilities in Canada. The company also makes reactor components and provides nuclear fuel and consulting services to Candu operators around the world. Cameco produces nuclear electricity through our 31.6% share of the four Bruce B reactors at the Bruce Power nuclear power generating site, North America's largest nuclear generating station, located in Ontario, Canada. Thus Cameco is a part of the Canadian Civilian Nuclear power Industry. Camieco owns about half of the Uranium currently mined in the United States of America. But the American uranium mining industry is small compared to the Uranium mining Industries of Canada, Australia, and several other countries. Thus the tax subsidy policies of the United States Government has little effect on the cost of uranium ore. However, in the past this might have been different. the Atomic Energy Commission desires desperately to uncover any new sources of worthwhile ore and the commission has announced that a $10,000 prize or bonus will be paid for the delivery of 20 tons of ore or concentrates that assay 20 percent or more in uranium oxide, provided that the material comes from a new, previously unworked deposit. In addition the commission will pay for the ore at the ordinary price. The offer applies to any discoveries inside the United States, its territories, possessions and the Canal Zone. . . . The guaranteed minimum AEC price for uranium ores is at the rate of $3.50 per pound of uranium oxide that is recoverable from the ore, less refining costs, plus allowances for other valuable minerals that may be contained in the ore. Carnotite ores are priced on a different schedule at rates that vary from 30 cents to $1.50 per pound of contained uranium oxide, plus certain bonuses, plus allowances for other valuable constituents. Carnotite purchases are made in minimum lots of 10 tons. Ores that assay less than 0.10 percent uranium oxide or that contain excessive quantities of lime are not purchased. in 1952 by Texan prospector Charles Steen, who went on to make millions of dollars . . .
large uranium ore deposits were first tapped for the voracious Cold War nuclear weapons program in the early 1950s, . . . The AEC purchased uranium to go into nuclear bombs, nuclear warheads, and reactors meant to power submarines, not domestic power reactors. Thus past domestic uranium subsidies were intended to produce uranium for military use, and not to subsidize the Civilian Nuclear power industry. The subsidies did not in fact produce a flourishing domestic uranium mining industry, and indeed once the military demand for uranium slowed, the domestic Uranium mining industry withered on the vine, because American produced uranium was more expensive than military surplus uranium, much of it coming from Russia, that was offered to civilian power reactors bythe United States Government. The intent of this program was to dispose of unwanted Russian weapons grade U-235 which the United States government feared would fall into evil hands and then used by terrorists and third rate failed states, to attack more peaceful countries. Paradoxically if domestic uranium mining is to be counted as part of what is included in the American domestic nuclear industry. the sale of low cost Russian U-235 to the American Civilian Nuclear Industry has weakened the mining sector of that industry. But if the United States government had stockpiled Russian uranium which it purchased to keep it away from evil hands, the domestic uranium mining industry would not have profited nearly as much as foreign uranium mines, that do not receive receive U.S. Government subsidies. The price of uranium would have risen, but this would have little effect on the cost of producing nuclear power in the United States as we have seen. Thus past large U.S. Government uranium mining subsidy policy was related to national security concerns, and failed on a long term bases to offer positive economic benefits to the domestic uranium mining, reactor manufacture and nuclear power production segments of the domestic nuclear power industry. Thus the so called "legacy" uranium mining subsidies would have been paid whether on not there was a domestic nuclear power industry, and much of it was paid before the inception of the civilian nuclear power industry. An estimate by the Texas comptroller (2008) pegged uranium’s share of this provi- sion at an insignificant $0.5 million for 2006, and that for coal at less than $30 million. In contrast, the Joint Committee on Taxation estimated total subsidies from percentage depletion flowing to fuels other than oil and gas to average $160 million per year between 2008 and 2012 (JCT 2008: 62). This figure, which applies to coal and uranium, is more than five times the Texas comptroller’s estimate. Three factors call both of these estimates into question. the subsidy value of percentage-depletion allowances for uranium is about $25 million per year. Nor does Kaplow acknowledge the subsidies to the Oil, natural gas, coal, wind, solar thermal and photovoltaic industries. between 1994 and 2007 the share of domestic uranium purchased by the civilian sector dropped from more than 20 per- cent to less than 8 percent . . . Surging uranium prices in the past few years have greatly increased interest in uranium mining throughout the West . . . But the few U.S based active Uranium mines produce only a tiny amount of the Uranium produced by the United States nuclear power industry, and half of the uranium produced comes from Canadian owned mines. Uranium-tailing remediation costs approach the value of ore. . . . The cost per pound of U3O8 produced, even using values only through 1999 (scaled to 2007 dollars), exceeded the average value of uranium during the period tracked by the EIA prior to the commodity price spikes that began in 2006. Even with surging prices included, socialized remediation costs were still more than 80 percent of the value of the ore produced during the period. Assuming full remediation costs, including all Title I sites, Title II sites, and unfunded liabilities associated with uranium mine and enrichment facilities, the degree of subsidy to upstream processes would grow even more substantially. But most of those tailings were produced by the mining of uranium for military purposes. A small percentage of those tailings can be legitimately be assigned to to the nuclear power industry. Yet Kaplow appears to believe that every penny payed by the government for uranium mine site reclamation is a subsidy to the domestic nuclear power industry. To cover the cost of proper mine reclamation, it is reasonable to assume that the price per pound of U3O8 would need to have roughly doubled. Based on data from the World Nuclear Association (WNA 2009b) on the contribution of raw uranium prices to the delivered price of nuclear power, the underpricing of uranium has generated a subsidy to nuclear power of 0.13 to 0.32 ¢/kWh of resultant nuclear electricity produced. It is striking that this range exceeds what the industry currently pays the federal government to take full responsibility for its nuclear waste from reactors. Is government cleanup of domestic uranium mines that was on federal own lands, and were mined because the government was purchasing uranium for military purposes, really a subsidy? Or is the government taking care of a responsibility which was its all along. Kaplow argues that government policy should have included bonding of uranium mines for the environmental consequences of its mining, but the government through its various arms was the principal consumer of uranium during the uranium rush days, and it made the rules easy so that uranium would be easy to obtain. Thus the uranium tailings were the consequence of government desires to lower military costs, not to benefit a civilian nuclear power industry. Thus the tailings clean up responsibilities can be largely assigned to the United States government, and thus is not a legacy subsidy for the nuclear power industry. In the nest part of this review, I will look more carefully at Kaplow's claims about the complex relationship between United States national security interests and the civilian nuclear power industry. This is the Part III of my review of Doug Koplow, Union of Concerned Scientists report titled, Nuclear Power: Still not viable without subsidies. ThePart I offered some definition of subsidies, and noted that very large government subsidies to the renewable power industry had not made renewable generated electricity cheap. Part I noted that the definitions of subsidy and nuclear industry needed to be determined in any valid study of subsidies, and questioned whether Koplow had done so. Part II looked at Koplow's claims about subsidies to the uranium mining and determined that these subsidies were largely intended to support military uses of uranium, were typical of the energy and mining industry, had little effect on the cost of nuclear generated electricity, and had offered little long term benefit to the either the American uranium mining industry or to the American civilian nuclear power industry as a whole. At the end of Part II. I promised to look carefully at Koplow's claims concerning the relationship between military nuclear weapons programs, and the civilian nuclear industry. Sharon Squassoni, director of the Proliferation Prevention Program at the Center for Strategic and International Studies, the “dual-use [civilian and military] nature of nuclear technology is unavoidable. For the five nuclear-weapons states, commercial nuclear power was a spinoff from weapons programs; for later proliferates, the civilian sector has served as a convenient avenue and cover for weapons programs” (Squassoni 2009a). By artificially accelerating the expansion of civilian programs, subsidies to nuclear technology and fuel-cycle services worldwide exacerbate the already challenging problems of weapons proliferation. To date, the negative externality of proliferation has not been reflected in the economics of civilian reactors. In fact there have been several attempts to serve military interests with ostensibly civilian oriented nuclear R&D programs. In other instances scientists diverted military programs to civilian purposes. The ORNL report,AN ACCOUNT OF OAK RIDGE NATIONAL LABORATORY’S THIRTEEN NUCLEAR REACTORS, by Murray W. Rosenthal demonstrates examples of both tedencies at ORNL. For example the ORNL gas cooled reactor was an attempted replication of the British dual purpose Magnox reactors. The British wanted to produce plutonium for bombs and simultaneously generate nuclear power, and the 50 MW(e) Calder Hall power plants that they built used dual-purpose reactors that could do both. The British did not yet have enriched uranium and had no domestic source of helium, so the Calder Hall reactors were restricted to natural uranium and used carbon dioxide as the coolant. The metal fuel was clad in a magnesium alloy called Magnox, and from that they came to be called Magnox reactors. The Calder Hall reactors were the first to supply commercial amounts of power to a utility grid. The dual-purpose Magnox reactors were followed in the United Kingdom by larger gas-cooled power reactors. They were still cooled with carbon dioxide but used low-enriched uranium in stainless-steel-clad UO2 fuel elements that enabled higher temperatures and thus higher thermal efficiency. The British attempt to kill two birds with one stone was much admired by some members of the United States Congress who probably thought the British approach would save money. In fact, the Magnox reactors produced plutonium of an inferior quality. British and American weapons testing involving the use of Magnox plutonium's, proved so disappointing that work on the Oak Ridge gas cooled reactor was terminated before the reactor could be tested. This was unfortunate because the gas cooled reactor was probably safer than conventional water cooled reactors. The ORNL Aircraft Reactor Experiment was an example of the diversion of money from a purely military program to civilian oriented scientific use. The idea was to design a reactor to power large military aircraft - bombers. The reactor had to be light and compact, but it also had to produce a lot of power. Oak Ridge engineers came up with a novel idea, a high temperature salt cooled reactor, with the uranium fuel dissolved in the liquid salt. None of the scientists and engineers involved in the project believed that the ARE would serve a military purpose. The Air Force was pleased with the performance of the ARE and brought Pratt and Whitney Aircraft Company aboard to develop the indirect cycle power plant. ORNL began the design of a compact 60 MW reactor. And in spite of growing skepticism about success and the recognition that missiles might substitute for bombers, industrial and political support kept the national program going. But it was killed in March 1961 soon after John Kennedy took office. Thus ORNL’s ANP program came to an end, but in its 12-year run, it greatly expanded knowledge of the chemistry and technology of molten salts and made advances in materials, shield design, and other areas that enlarged the Laboratory’s ability to undertake new projects. So basically ORNL Director Alvin Weinberg tricked the United States Air Force into developing new civilian nuclear technology. The Shippingport Reactor was an apparently successful dual purpose nuclear program, but one which was to have a serious long term consequences for the United States nuclear industry. The design of the Shippingport reactor emerged from the design of the of a reactor intended to power air craft carriers. Early in the Eisenhower the Navy was not yet ready to build nuclear carriers, so when President Eisenhower proposed the Atoms for Peace Program Hyman Rickover offered to build an experimental nuclear power plant based on the Navy carrier reactor design, but with low enriched fuel, rather than the highly enriched fuel. The beauty of the Rickover plan is that the Navy got a reactor it wanted to test for nothing while seemingly operating the test reactor as a peaceful atomic project. While the Shippingport project probably proved useful to the Navy, it may have had a negative impact on the development of the Civilian nuclear industry. Everyone involved in reactor development understood that there were safety problems with the Light Water Reactor (LWR). The military realized that there were safety problems with its LWRs, but thought that it could solve those problems with careful designs, reactor operator training, and rule books that cover every possible aspect of reactor operation. The Soviets did not take reactor safety seriously, used careless naval reactor designs, allowed untrained people operate its reactors, and had operation rule books that were no where as strict and comprehensive. The Soviets had far more accidents, and worse accidents, so the U.S. Navy's approach works, but the U.S. submarines were Cadillacs driven by engineers who followed precise rules, while the Soviet subs were probably cheaper to own and operate. Sure accidents in Soviet Subs would every now and then kill a member of the crew, but there were always plenty of farm boys who could take their place. Unfortunately the Cadillac approach is required to keep the Light Water Reactor safe, so towards the Light Water Reactor safety ends up costing money, which the Civilian Nuclear Power industry has to pay. LWR operators are expensive to train, and everyone has to follow detailed rulebooks. All of which makes nuclear power expensive. Those expensive reactors frightened the public too. Of course, nuclear power while expensive, is not as expensive as making renewable generated electricity reliable. And a reliable no-nuclear, all renewable grid can be built with big enough subsidies, built that is, if society does not collapse under the weight of the subsidies to renewable power. Edward Teller had a different approach to nuclear safety. He thought that reactors should b e buried deep underground and operate with out human intervention. That way if the reactor broke, you could throw in a few shovels of dirt, and that would be all it took to keep the reactor safe forever, or so Teller thought. Towards the end of his life, Teller realized that Alvin Weinberg's Molten Salt Reactor (MSR) was safe, and that if you built MSRs they would not have to be buried so deep in order to protect the public. The MSR was very stable, in fact so stable that no operators were required. Since the reactor core was a molten fluid, you did not have to worry about nuclear meltdown. Teller explained it all in his last paper, Thorium fueled underground power plant based on molten salt technology. We don't have MSRs because the government preferred to subsidize a money pit called the Fast Breeder Reactor. People at ORNL knew that the MSR would be cheaper to develop, cheaper to build, and cheaper to operate. But the fast breeder was capable of producing bomb grade plutonium. Could the MSR be built without subsidies? Undoubtedly yes, it would be no more expensive develop than a modern large passenger jet is. It would probably be no more expensive to buy as well. A business would just have to be willing to take an unsubsidized risk. is quite problematic. Many of the dual purpose technologies proved quite useless for military purposes, and in other instances development of military technologies for civilian purposes proved quite expensive as well as militarily useless. By artificially accelerating the expansion of civilian programs, subsidies to nuclear technology and fuel-cycle services worldwide exacerbate the already challenging problems of weapons proliferation. is more than questionable. The fact is that with the exception of India, nuclear power programs played no role in the development of nuclear weapons, and India should have never been excluded from the original nuclear arrangement. It is absurd to suggest that cost related to nuclear proliferation and its prevention somehow represent a subsidy to the nuclear power industry. The global spread of nuclear technology has not lead to nuclear proliferation. Most nations which have developed nuclear weapons without authorization by anti-proliferation treaties, have done so without possessing civilian nuclear power industries. Knowledge of nuclear weapons technology is sufficient to start a nuclear weapons program, and that knowledge can be found in physics and physics and engineering text books. South Africa demonstrated that a limited number of nuclear weapons could be built from scratch very cheaply. The nuclear proliferation problem will not go away, or lessen even if there are no civilian power reactors, as long as there are physic and engineering textbooks. We are grateful to the following people for reviewing versions of this paper: Michele Boyd (Physicians for Social Responsibility), Peter Bradford (University of Vermont Law School), Simon Carroll (Swedish Biodiversity Centre and Member, Nuclear Liabilities Financing Assurance Board, UK), Mark Cooper (University of Vermont Law School), Robert Cowin (UCS), Antony Frogatt (Chatham House), Ken Green (American Enterprise Institute), Autumn Hanna (Taxpayers for Common Sense), Dusty Horwitt (Environmental Working Group), Stan Kaplan (U.S. Congressional Research Service), Amory Lovins (Rocky Mountain Institute), Ed Lyman (UCS), Arjun Makhijani (Institute for Energy and Environmental Research), Alan Nogee (UCS), Doug Norlen (Pacific Environment and ECA Watch), Marcus Peacock (Pew Charitable Trusts/Subsidyscope), Mycle Schneider (Mycle Schneider Consulting), Henry Sokolski (Nonproliferation Policy Education Project), Sharon Squassoni (Center for Strategic and International Studies), and Steve Thomas (University of Greenwich Business School). Didn't one of them catch the erroneous linking of the nuclear proliferation problem and subsidies? Of course most of these reviewers are strident critics of nuclear power, who may be emotionally incapable of spotting logically fallacious anti-nuclear arguments. Thus the marriage of military and civilian nuclear technology proved to be quite unsuccessful, and in cases where it worked, expensive. Reactors that are both cheaper and safer are possible, and without subsidies. What is required is some investors who are bold and imaginative enough to take some risks. Government subsidies to the nuclear power industry have been relatively small, and have not enhanced nuclear weapons programs. A civilian nuclear power industry might flourish if left to its own devices and if it were willing to take a risk on the molten salt nuclear technology developed in Oak Ridge. Update: I am reposting this 4 part series on Nuclear subsidies which critiques inaccurate claims about subsidies to the nuclear power industry, made by lobbiests for thev fossil fuel and the socalled renewable power industries. These two industries, often viewed as enemies, often appear to be joined together at the4 hip, by their shared hostility to clean, safe nuclear power. I am planning to begin a new series on subsidies, which explors the justification of subsidies in depth. I am repostThis is Part IV of my review of Doug Koplow's "Nuclear Power: Still not viable without subsidies." In Part I, I examined the definition of subsidies and looked at several limiting cases, including subsidies to an energy related project, the Cape Wind Project. Par II focused on Government policy toward the domestic Uranium mining Industry, and the National Defense context of that policy, and questioned both the intended and actual benefit of these policies for the nuclear power industry. Part III examined the relationship between United States military interest and the interest of the Nuclear power industry, and concluded that the relationship between the two had not served the interest of the Nuclear Power Industry. Despite the fact that I disagree with many of Doug Koplow's contentions, especially with respect to his farcical account of the so called "legacy subsidies," and his utter failure to compare U.S. Government subsidies to the renewable power industry to subsidies to the nuclear power industry. Koplow is not entirely on the wrong track. Not entirely, but certainly partially. In enrichment, the federal government historically took on all financial risk for building up capacity, and for many years it sold the enriched fuel to commercial reactors below cost. The U.S. enrichment picture, via the privatized U.S. Enrichment Corporation, now has a more complicated mix of policies that seem primarily aimed at keeping a U.S. firm in the enrichment market rather than keeping low-enriched uranium (LEU) prices low. Government subsidies to the sector globally, however, appear to spur overcapacity, generating artificially low fuel costs. Koplow's argument seems to run close to the tail wagging the dog. We have seen in Part II of this review that nuclear generated electricity would continue to be competitive even if the cost of nuclear fuel was much higher. The primary enrichment technology which the United States Government has employed is the obsolete Gaseous Diffusion technology. The Gaseous Diffusion systems uses 50 times more electricity than the more modern gas centrifuge process. An even more advanced laser enrichment processes is being developed. The United States built three very large and expensive Uranium Enrichment plants during World War II and the Cold War. Even before the end of the Cold War the United States had acquired all the Highly Enriched Uranium it needed to fight several global nuclear wars. Thus objectively the continued operations of the American Gaseous Diffusion Plants was not a military necessity, and thus their continued operation was no longer required, but for both military and political reasons, the United States Government wished to maintain its uranium enrichment capacity. The huge World War II K-25 plant in Oak Ridge, was however in physically bad shape, due to its hurried World War II construction it had a leaky roof, that lead to all sorts of problems. Since K-25 was no longer required the decision was made to shut K-25 down and junk it. The life of the other two Gaseous Diffusion plants was prolonged by selling LEU to the nuclear power industry, although to do so, the plants had to operate at a loss. But was this intended as a subsidy to the American Nuclear Power industry, or an attempt to keep military assets available after the end of their useful life, as well as a pork barrel program. Keeping the Gaseous Diffusion Plants open meant thousands of jobs in industrially depressed Western Kentucky and Southern Ohio. Not only did Gaseous Diffusion plants play roles subsidising local economies, but the plants' voracious appetite for electricity, meant that several local coal mines would be kept open. While there is the potential of federal payments to nuclear accident victims, there has been no direct subsidy of the nuclear power industry through the PAA. Thus Koplow's inclusion of Price-Anderson in a discussions of nuclear subsidies is problematic. And his inclusion of the liability cap as a subsidy, with out noting Geoffrey Rothwell is simply in excusable. Koplow does note Rothwell research when it does support his nuclear subsidies contentions. This is called cherry picking. Koplow does some interesting things to say about potential reforms in Price-Anderson, but this properly belongs in another report, since he has not established that Price-Anderson is contains a nuclear industry subsidy. This is not the case. Investments made for R&D for military nuclear programs were no more subsidies to the commercial nuclear industry, than military investments in aircraft technology during World Wat I, World War II, the Cold War and the post-Cold War era, were subsidies to the domestic air industry. Nor was government investment in radio technology R&D beginning in World War I and continuing into the 21st century radio industry subsidies. Koplow has not demonstrated his case, which he argues by compounding errors. In addition to legacy subsidies, the industry continues to benefit from subsidies that offset the costs of uranium, insurance and liability, plant security, cooling water, waste disposal, and plant decommissioning. We have seen that Koplow ignores the role that national defense interest have played in establishing uranium costs, and the questionable nature of the case that the government subsidizes NPP insurance. NPP security is a national defense issue. It is appropriate for the national government to set security standards, and, even play a role in NPP security operations if that is needed. Water permits are hardly a big deal, in terms of economic benefits. Nuclear Waste disposal is primarily a political issue, and the current system is for the NPPs to play the national government for waste disposal services which it does not provide. This is not a subsidy by the government. In fact the NPP industry takes care of its own waste and most likely will do so for years to come. Finally NPPs pay a fee for plant decommissioning. It might be debated whether the fee is sufficient, but the current system does not involve direct government subsidies of decommissioning systems. Koplow account of nuclear power industry subsidies is disingenuous if not dishonest. Furthermore Koplow knowingly ignores the relationship between nuclear subsidies and government subsidies to other energy forms. Government subsidies to the fossil fuel industries are much greater in terms of dollars spent, and government subsidies to to wind and solar industries are much higher per unit of energy those industries produce. Koplow study singles out nuclear power for a mainly unjustified attack, and proceeds to launch that attack in a way that distorts and decreases the readers knowledge of the subject. Koplow's goal seems to be the crafting of Counter knowledge. Both subsidies to energy in general as well as subsidies to nuclear power in particular ought to be the subjects of serious discussions. but subsidies to nuclear power should not be wholly separated from the wider topic. In addition the definition of subsidies should be clarified, alleged examples of subsidies examined, and rejected if they do not seem to fit within the topic. Furthermore, as we have seen supposed subsidies play complex roles in the operations of government. Government departments and agencies cannot subsidize each other, but they may transfer funds. Such fund transfers may have political purposes in mind. What may seem to be a government subsidy to an industry, may in fact be a transfer of funds to the workers in a different industry. Much of what Koplow views as government subsidies to the nuclear power industry are not subsidies at all, but he is correct that the relationship between the nuclear power Industry and the government is an important area for study. It has been my conclusion, drawn from material I pointed to in this review, that we need to understand how government programs can damage as well as aid the interests of energy industries, and of energy consumers. This study would be useful if the goal of government is to better shape energy programs in order to serve the public interest. Although he often misses his mark by a wide measure, Koplow's account is still not without its uses, as I have pointed out. Supporters of nuclear power should pay attention to its critics, just as supporters of renewable energy should focus attention on what their their critics have to say. The critics of the use of nuclear energy should listen to what its defenders say in response, especially when the defenders point out factual and thinking errors in the critics case. I had intended to wrap up my series on nuclear subsidies with this post, but I now believe that at least one further post is required. We need to examine the circumstances under which subsidies to the nuclear power industry might be or are justified. Update: This post is a reposting of a December 2008 post. In that post I points to an outright coal advocate who has greatly influenced environmentalists thinking about energy, and arguably has influenced it for the worse. We will begin to see how E. F. Schumacher began to reconstruct economics to fit 19th century Roman catholic Dogma, but cleverly disguised what he did. We will also see how Schumacher influanced Amory Lovins, and how that influance may have led Lovins to serve the interest of coal over that of nuclear. I intend that all of this will unfold during the next few posts. The Buddha was roughly a contemporary of the Judean thinker Jeremiah. Both were deeply concerned with the existential problems posed by human insecurity. The Iron age created the possibility of human wealth, but left human life highly insecure. The philosopher Karl Jaspers noted emergance of important thinkers and schools of thought in many human societies during the Iron Age. High interest rates mean even lower economic growth from the US and thus even lower consumption of Chinese-made goods. China cannot afford a weak US dollar – its US dollar reserves are worth less, and more importantly, its product becomes more expensive for US consumers. What I’m struggling to do is to help recapture something our ancestors had. If we can just regain the consciousness the West had before the Cartesian Revolution, which I call the Second Fall of Man, then we’ll be getting somewhere. One must understand that in energy matters Schumacher was a long time advocate of Coal. He consulted for many years with the British Coal Board, and no doubt his acknowledge opposition to both oil and nuclear power was in no small measure to his vested interest in the fortunes of coal. But Charles Fager pointed out something else about Schumacher thinking about economics. Small Is Beautiful -- a message so skillfully delivered that it has been absorbed by his audiences apparently without being noticed. What is the message? Nothing less than a passionate plea for the rediscovery of old-time Western religion -- Roman Catholic religion, to be precise. He readily owned up to being a Catholic, a certified convert as of five years ago. This item is not mentioned in his book; in fact, one of the most frequently cited chapters, “Buddhist Economics,” almost made it appear as if he were deeply involved in Eastern religions. But wasn’t this chapter, I inquired, really more informed by the Catholic writings and thinkers he mentioned so frequently elsewhere in the book -- the papal encyclicals, Newman, Gilson and, above all, Thomas Aquinas? Fager, relying on Catholic theologian John Coleman, pointed out the sources of the core concepts of Small is Beautigul, the neo-Thomistic philosophy of French Philosopher Jacques Maritain, who thought that small institutions were more humaine than large institutions, and English Catholic writers G. K. Chesterton, Hillaire Belloc and Eric Gill, who talked of decentralizing industry also appeared to have influenced Schumacher. Thus Schumacher can be claassified as a "conservative revolutionaries’ or ‘reactionary radicals’ but not a progressive. It ought to be noted that Schumacher had a profound impact on the thinking of Amory Lovins who is a member of the board of the E. F. Schumacher Society. Thus Schumacher plsys a major and to my mind very wrong headed role in the development of "Progressive" thinking on the human relationship to the environment. Unfortunately for his "progressive" admirers, Schumacher is a reactionary, who utterly repudiates the ideas upon which matrial progress is built. Let me say first that I admire the intellectual accomplishments of Buddhism which I view as a sort of Asian mental health movement. I do not regard Buddhism as an anti-materialist philosophy. Far from it, Buddhism teaches people how to live in a world where their human and material expectations are likerly to be disappointed. The Buddha would tell us that it is natural for people to desire things, and to to strive to have them, but that if we fail to expect material things to be more than temporary we are mistaken, ands likely to be disappointed. Disappointment is painful. Thus far from being anti-materialist, Buddhism accepts the existence of a material world, and teaches us how to come to terms with the fact that material things do not last forever. Do Buddhist enjoy, appreciate and desire material things? Yes indeed they do. the vagueness of the Buddhist canon on economic matters combined with its complexity and length allows room for quite different interpretations of an ideal economic system in modern times, especially since conditions are very much different than they were more than 2000 years ago when the Buddha lived. Of course, this situathon is little different from that of Christianity. The really difficult problem is to determine what part of the canon will be taken seriously under what circumstances, but this would require a much different kind of approach than the textual exegesis offered here. Schumacher conceived of the ideas of Buddhists economics while serving as a consultant for the government of Burma in the mid 1950's. The Buddhist economic program of U Nu, who Schumacher advised failed, and the country has been rulled for many years by a corrupt and tyrantical military 7Junta. "Right Livelihood" is one of the requirements of the Buddha’s Noble Eightfold Path. It is clear, therefore, that there must be such a thing as Buddhist economics. All the same, such countries invariably assume that they can model their economic development plans in accordance with modern economics, and they call upon modern economists from so-called advanced countries to advise them, to formulate the policies to be pursued, and to construct the grand design for development, the Five-Year Plan or whatever it may be called. No one seems to think that a Buddhist way of life would call for Buddhist economics, just as the modern materialist way of life has brought forth modern economics. Economists themselves, like most specialists, normally suffer from a kind of metaphysical blindness, assuming that theirs is a science of absolute and invariable truths, without any presuppositions. Some go as far as to claim that economic laws are as free from "metaphysics" or "values" as the law of gravitation. We need not, however, get involved in arguments of methodology. Instead, let us take some fundamentals and see what they look like when viewed by a modern economist and a Buddhist economist. There is universal agreement that a fundamental source of wealth is human labour. Now, the modern economist has been brought up to consider "labour" or work as little more than a necessary evil. From the point of view of the employer, it is in any case simply an item of cost, to be reduced to a minimum if it can not be eliminated altogether, say, by automation. From the point of view of the workman, it is a "disutility"; to work is to make a sacrifice of one’s leisure and comfort, and wages are a kind of compensation for the sacrifice. Hence the ideal from the point of view of the employer is to have output without employees, and the ideal from the point of view of the employee is to have income without employment. The consequences of these attitudes both in theory and in practice are, of course, extremely far-reaching. If the ideal with regard to work is to get rid of it, every method that "reduces the work load" is a good thing. The most potent method, short of automation, is the so-called "division of labour" and the classical example is the pin factory eulogised in Adam Smith’s Wealth of Nations. 4 Here it is not a matter of ordinary specialisation, which mankind has practiced from time immemorial, but of dividing up every complete process of production into minute parts, so that the final product can be produced at great speed without anyone having had to contribute more than a totally insignificant and, in most cases, unskilled movement of his limbs. The Buddhist point of view takes the function of work to be at least threefold: to give man a chance to utilise and develop his faculties; to enable him to overcome his ego-centredness by joining with other people in a common task; and to bring forth the goods and services needed for a becoming existence. Again, the consequences that flow from this view are endless. To organise work in such a manner that it becomes meaningless, boring, stultifying, or nerve-racking for the worker would be little short of criminal; it would indicate a greater concern with goods than with people, an evil lack of compassion and a soul-destroying degree of attachment to the most primitive side of this worldly existence. Equally, to strive for leisure as an alternative to work would be considered a complete misunderstanding of one of the basic truths of human existence, namely that work and leisure are complementary parts of the same living process and cannot be separated without destroying the joy of work and the bliss of leisure. From a Buddhist point of view, this is standing the truth on its head by considering goods as more important than people and consumption as more important than creative activity. It means shifting the emphasis from the worker to the product of work, that is, from the human to the subhuman, a surrender to the forces of evil. The very start of Buddhist economic planning would be a planning for full employment, and the primary purpose of this would in fact be employment for everyone who needs an "outside" job: it would not be the maximisation of employment nor the maximisation of production. Women, on the whole, do not need an "outside" job, and the large-scale employment of women in offices or factories would be considered a sign of serious economic failure. In particular, to let mothers of young children work in factories while the children run wild would be as uneconomic in the eyes of a Buddhist economist as the employment of a skilled worker as a soldier in the eyes of a modern economist. While the materialist is mainly interested in goods, the Buddhist is mainly interested in liberation. But Buddhism is "The Middle Way" and therefore in no way antagonistic to physical well-being. It is not wealth that stands in the way of liberation but the attachment to wealth; not the enjoyment of pleasurable things but the craving for them. The keynote of Buddhist economics, therefore, is simplicity and non-violence. From an economist’s point of view, the marvel of the Buddhist way of life is the utter rationality of its pattern—amazingly small means leading to extraordinarily satisfactory results. For the modern economist this is very difficult to understand. He is used to measuring the "standard of living" by the amount of annual consumption, assuming all the time that a man who consumes more is "better off" than a man who consumes less. A Buddhist economist would consider this approach excessively irrational: since consumption is merely a means to human well-being, the aim should be to obtain the maximum of well-being with the minimum of consumption. Thus, if the purpose of clothing is a certain amount of temperature comfort and an attractive appearance, the task is to attain this purpose with the smallest possible effort, that is, with the smallest annual destruction of cloth and with the help of designs that involve the smallest possible input of toil. The less toil there is, the more time and strength is left for artistic creativity. It would be highly uneconomic, for instance, to go in for complicated tailoring, like the modern West, when a much more beautiful effect can be achieved by the skillful draping of uncut material. It would be the height of folly to make material so that it should wear out quickly and the height of barbarity to make anything ugly, shabby, or mean. What has just been said about clothing applies equally to all other human requirements. The ownership and the consumption of goods is a means to an end, and Buddhist economics is the systematic study of how to attain given ends with the minimum means. Simplicity and non-violence are obviously closely related. The optimal pattern of consumption, producing a high degree of human satisfaction by means of a relatively low rate of consumption, allows people to live without great pressure and strain and to fulfill the primary injunction of Buddhist teaching: “Cease to do evil; try to do good.” As physical resources are everywhere limited, people satisfying their needs by means of a modest use of resources are obviously less likely to be at each other’s throats than people depending upon a high rate of use. Equally, people who live in highly self-sufficient local communities are less likely to get involved in large-scale violence than people whose existence depends on world-wide systems of trade. From the point of view of Buddhist economics, therefore, production from local resources for local needs is the most rational way of economic life, while dependence on imports from afar and the consequent need to produce for export to unknown and distant peoples is highly uneconomic and justifiable only in exceptional cases and on a small scale. Just as the modern economist would admit that a high rate of consumption of transport services between a man’s home and his place of work signifies a misfortune and not a high standard of life, so the Buddhist would hold that to satisfy human wants from faraway sources rather than from sources nearby signifies failure rather than success. The former tends to take statistics showing an increase in the number of ton/miles per head of the population carried by a country’s transport system as proof of economic progress, while to the latter—the Buddhist economist—the same statistics would indicate a highly undesirable deterioration in the pattern of consumption. The teaching of the Buddha, on the other hand, enjoins a reverent and non-violent attitude not only to all sentient beings but also, with great emphasis, to trees. Every follower of the Buddha ought to plant a tree every few years and look after it until it is safely established, and the Buddhist economist can demonstrate without difficulty that the universal observation of this rule would result in a high rate of genuine economic development independent of any foreign aid. Much of the economic decay of southeast Asia (as of many other parts of the world) is undoubtedly due to a heedless and shameful neglect of trees. Modern economics does not distinguish between renewable and non-renewable materials, as its very method is to equalise and quantify everything by means of a money price. Thus, taking various alternative fuels, like coal, oil, wood, or water-power: the only difference between them recognised by modern economics is relative cost per equivalent unit. The cheapest is automatically the one to be preferred, as to do otherwise would be irrational and "uneconomic." From a Buddhist point of view, of course, this will not do; the essential difference between non-renewable fuels like coal and oil on the one hand and renewable fuels like wood and water-power on the other cannot be simply overlooked. Non-renewable goods must be used only if they are indispensable, and then only with the greatest care and the most meticulous concern for conservation. To use them heedlessly or extravagantly is an act of violence, and while complete non-violence may not be attainable on this earth, there is nonetheless an ineluctable duty on man to aim at the ideal of non-violence in all he does. Just as a modern European economist would not consider it a great achievement if all European art treasures were sold to America at attractive prices, so the Buddhist economist would insist that a population basing its economic life on non-renewable fuels is living parasitically, on capital instead of income. Such a way of life could have no permanence and could therefore be justified only as a purely temporary expedient. As the world’s resources of non-renewable fuels—coal, oil, and natural gas—are exceedingly unevenly distributed over the globe and undoubtedly limited in quantity, it is clear that their exploitation at an ever-increasing rate is an act of violence against nature which must almost inevitably lead to violence between men. Even if this were dismissed as a long-term view there is the immediate question of whether "modernisation," as currently practised without regard to religious and spiritual values, is actually producing agreeable results. As far as the masses are concerned, the results appear to be disastrous—a collapse of the rural economy, a rising tide of unemployment in town and country, and the growth of a city proletariat without nourishment for either body or soul. It is in the light of both immediate experience and long term prospects that the study of Buddhist economics could be recommended even to those who believe that economic growth is more important than any spiritual or religious values. For it is not a question of choosing between "modern growth" and "traditional stagnation." It is a question of finding the right path of development, the Middle Way between materialist heedlessness and traditionalist immobility, in short, of finding "Right Livelihood."